Astydney's evasive maneuvers are not up to par. 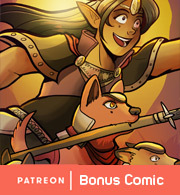 Another few comics to take a look at, and the last of our new SpiderForest features! The Last Traveler: A young lady is summoned through a forbidden portal to a world of dragon societies, strange magic, and handsome princes. If you're into royal courtly dramas, but also dragons, give it a look! It just started Chapter 4 a few weeks ago! Fighting Dreamers: A heroic team of sleeping housecats hone their skills and battle the nightmares of every dreaming creature with their dream-fueled battle avatars. If you've ever watched The Matrix and thought "this movie would be better if they were all cats", check this comic out! Goddess of Paradise: An ancient goddess wakes from a long slumber only to find her power gone and her fellow divine buddies scattered. 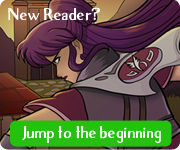 The quest to reunite them is a fun, actiony, spell-slinging adventure. Very fun characters and style on this one! Corner the Maze: A Formula One racer zooms through a portal mid-race into a fantastical moonscape, where warriors battle to keep demonic forces at bay. Is he the hero this world needs? Will he make it out to finish the race? And why is his car talking now?